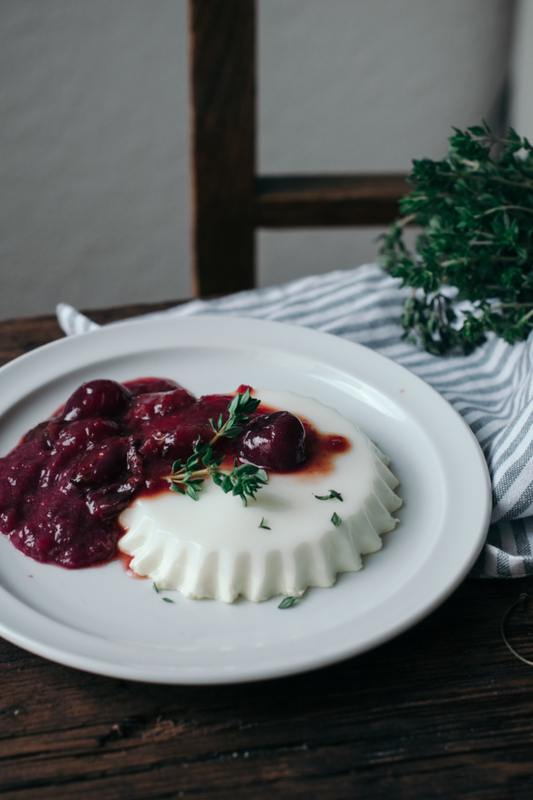 The cherry season is always my favorite and I started to celebrate it with this goat milk panna cotta with thyme syrup & cherry compote! 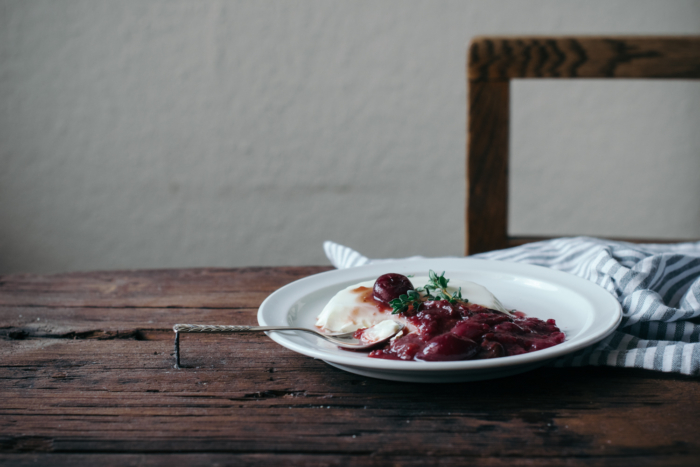 I’m actually finishing to write this post with my hand going back and forth between the bowl of cherries, my pot of homemade tapenade and the pile of freshly made seed crackers – Sarah Britton’s recipe is simply perfect! It’s 6pm here in Berlin and the idea of skipping lunch was clearly not the smartest one. I went for some wanderings in Tiergarten instead, looking for some elderflowers that I could turn into elderflower syrup. 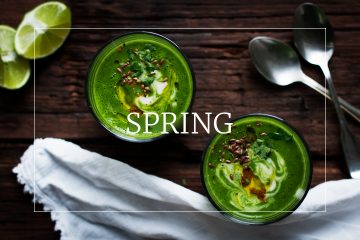 Which means: watch out, a bunch of recipes are on their way! To get back to the cherry topic, it’s without any doubt one of my favorite fruits since I was a child. In spite of that, one question is coming back to my mind each time I’ve eaten some lately. Like for strawberries, I have the feeling that they are not as flavourful as in my childhood memories anymore. I noticed since a while that it can be hard sometimes to find tasty fruits or veggies in Berlin, especially when it comes to tomatoes, berries or summer fruits like peaches, apricots, etc…Even though I usually favour organic ones for that kind of products, it’s still the same and it’s more and more rare for me to enjoy them as much as before. 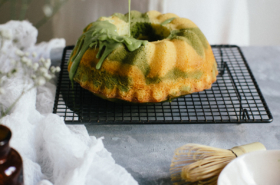 At the risk of seeming like a food snob, organic food doesn’t always solve that kind of problematics, unfortunately. 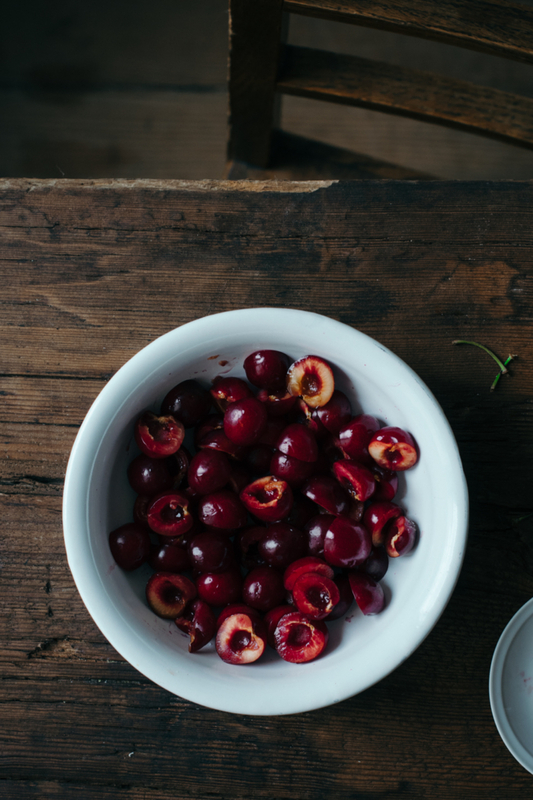 Cherries that are picked when barely mature, then imported from Georgia via everything but local distribution have at the end pretty low chances to be as tasty as the ones you can buy at the farmers market, from the local producer’s stand. 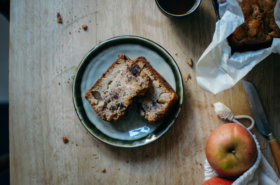 While feeling more involved into ways to consume and becoming more responsible throughout the last years, I also realised that our choices and opinions don’t only matter when taking short-term decisions, but also in our way to consume on a daily basis – and one of the first places where this happens is in our plate. What bothers me the most in all of that is to see that in spite of the raise of awareness about it and the willingness to consume better, this choice isn’t given to us so easily. Even if it involves for me to pay it more expensive, I would like to be able to choose in supermarkets, without finding as only option those tasteless cherries that traveled thousands miles to come to my plate, coming with a bunch of chemicals on them, indeed. 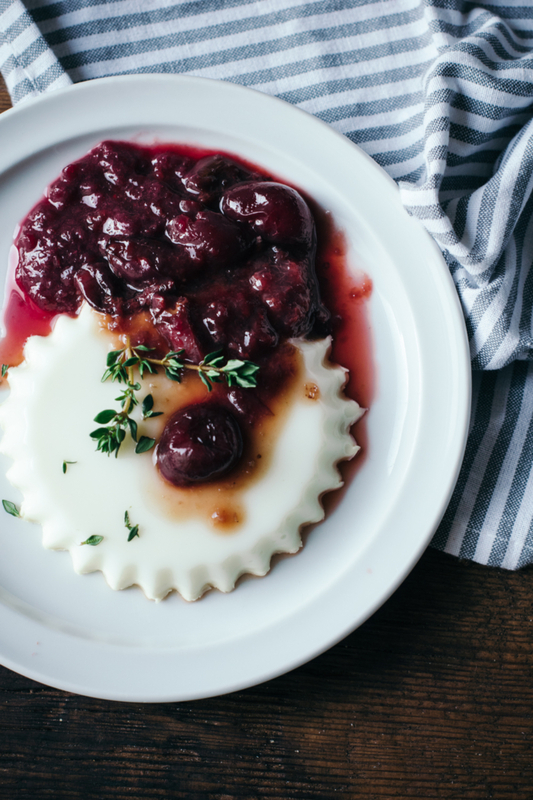 So if you have the possibility to do so, rather opt for juicy and ripe cherries, so that you can enjoy the flavours of those goat milk panna cotta with thyme syrup & cherry compote at their best. 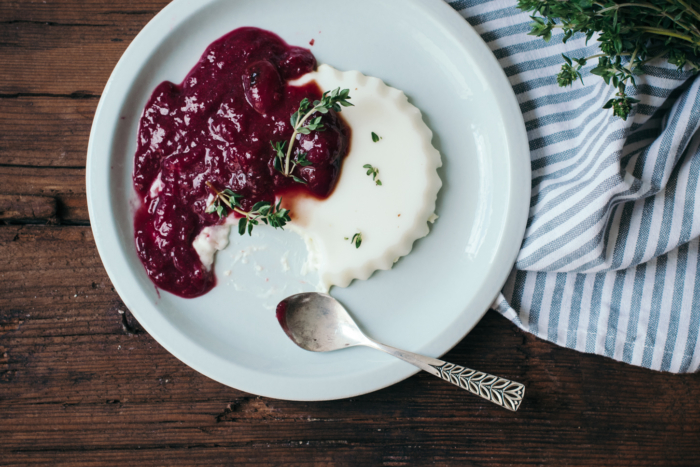 If you don’t want to use goat milk, you can totally swipe it for cow or vegetal milk – the taste of the panna cotta won’t be denatured. 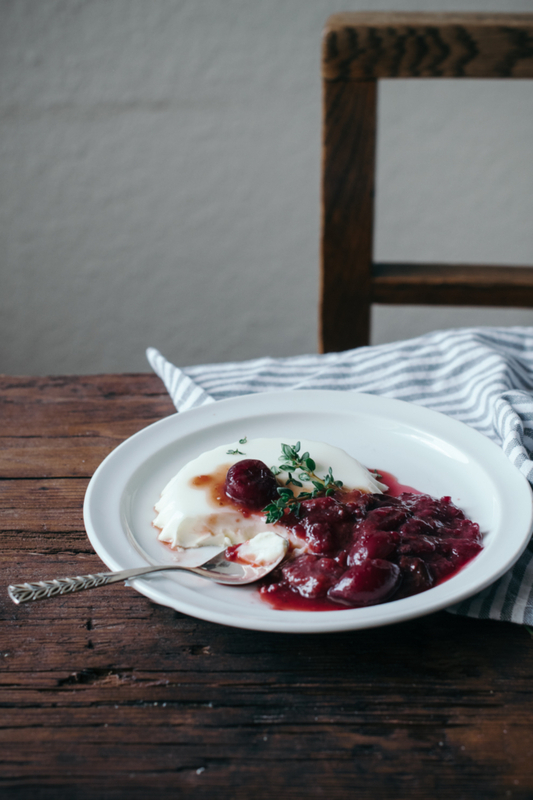 Goat milk rather adds a sparkling touch that is fitting well with thyme syrup. 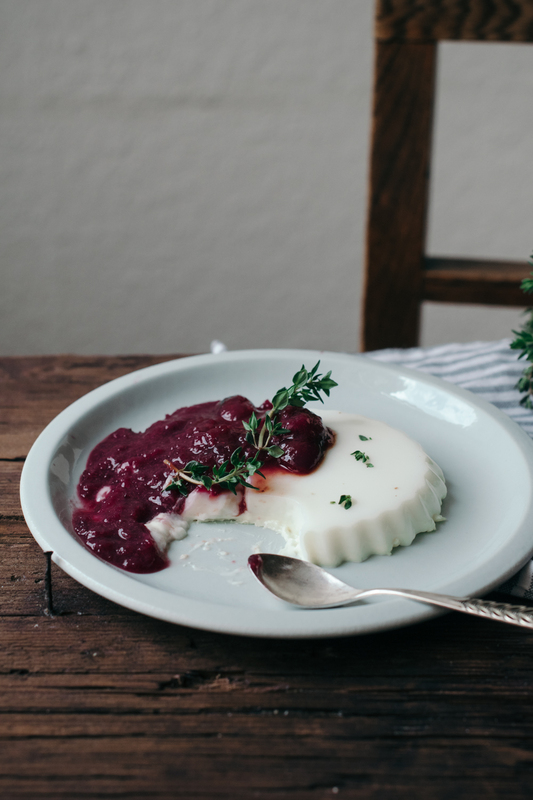 Sprinkle the panna cotta with fresh thyme leaves, and serve them with sablé biscuits if you want an even more indulgent treat! 1. Prepare the thyme syrup: heat water and sugar together in a small pan, until sugar gets completely dissolved. Turn off fire and add fresh thyme sprigs into the syrup. Cover and let infuse at room temperature for 24h. 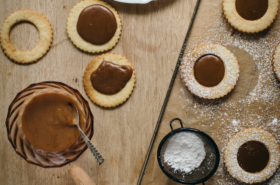 When ready, filter the syrup and pour it into a bottle. Set aside in fridge. 2. 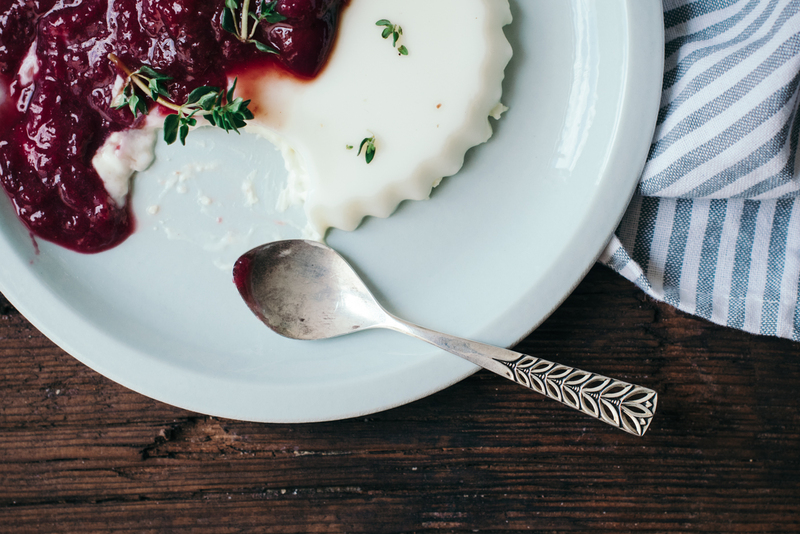 Prepare panna cotta: let soak gelatin sheets for 5 minutes in a bowl of cold water. In the meantime, put goat milk, single cream and thyme syrup on medium heat. Stir well and turn off fire when the liquid is hot. Dry gelatin sheets and add them into the panna cotta batter. Stir until complete dissolution. 3. 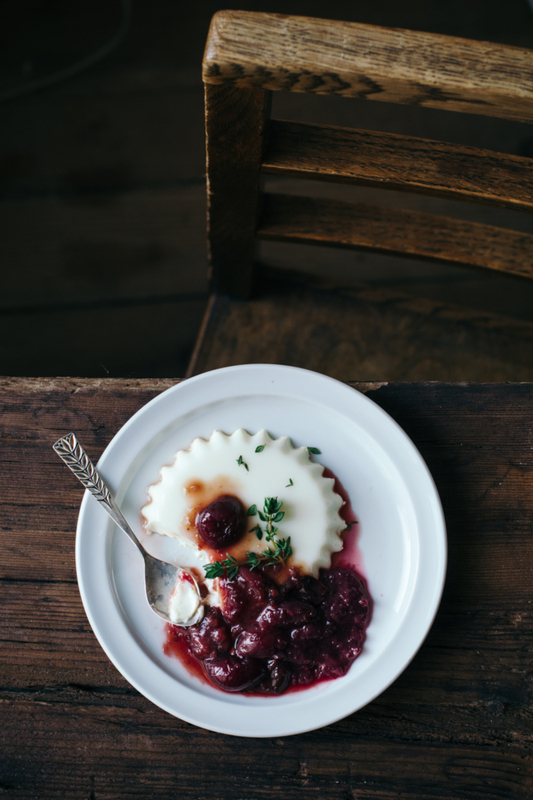 Pour the panna cotta batter in 4 tartlet or pudding moulds and let cool down. Put in fridge and let sit for at least 4h. 4. 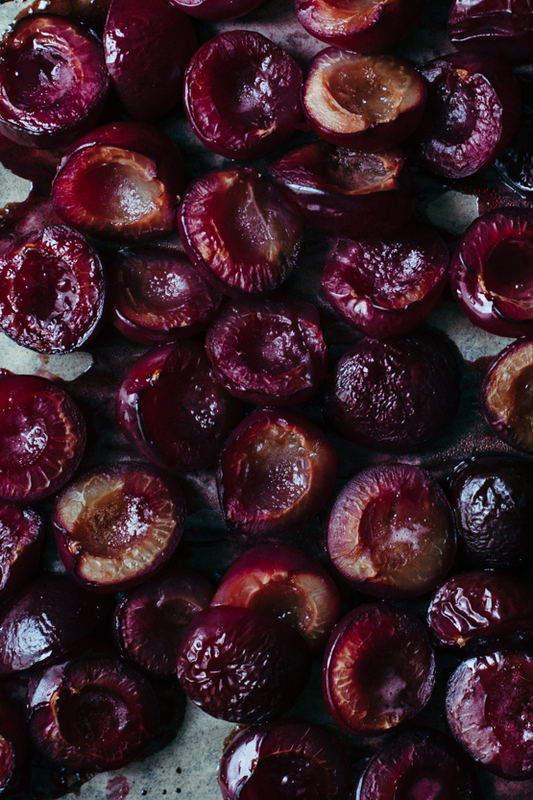 Prepare the cherry compote: stone cherries and cut them in two. Put in a pan with coconut sugar and lemon juice, stir well. Let simmer for about twenty minutes on low heat, until cherries get tender but still hold together. Let cool aside. 5. You can either mix them in a blender if you want a smooth compote texture, or you can let them like this if you prefer as chunks in syrup. 6. 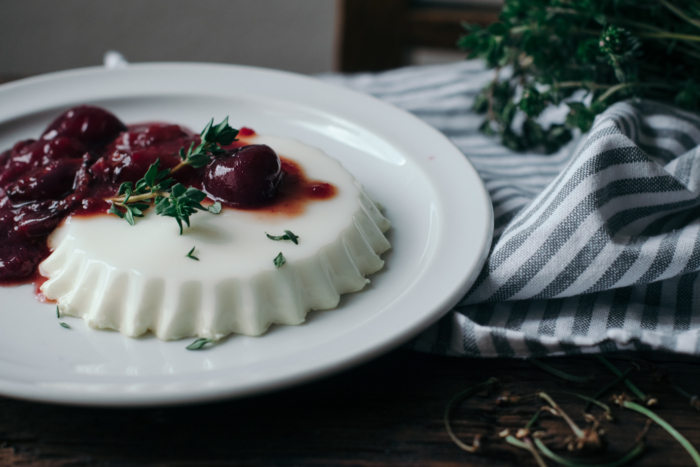 Take out the panna cotta from fridge about 10 minutes before to serve. 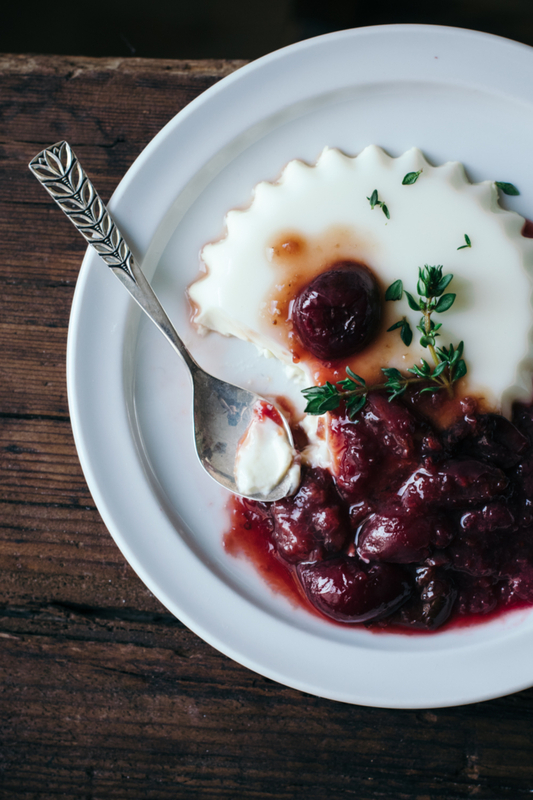 Turn them carefully onto plates, then pour some cherry compote onto each of them. Sprinkle with extra fresh thyme and serve.